1. Killer on the loose: A manhunt is ongoing Monday morning for a Palestinian suspected of killing a soldier, stealing his gun and opening fire on others in the area before fleeing to a nearby village. 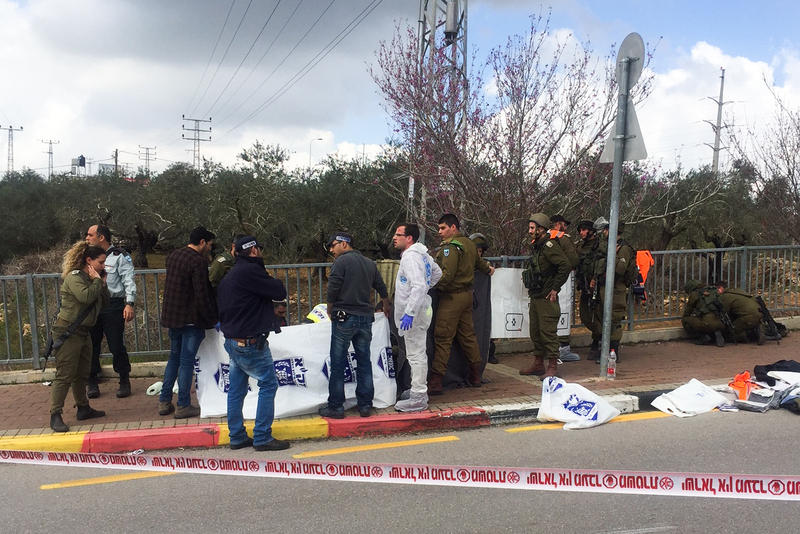 Soldier Gal Keidan is killed at the scene and Rabbi Achiad Ettinger, a father of 12, also succumbs to his wounds Monday. According to Ettinger’s siblings, even after he was shot he managed to fire at the terrorist, though he did not hit him. “He turned his car around to face him and managed to aim his weapon and get off four shots,” the Yedioth Ahronoth newspaper reports. On Monday morning, Israeli media reports that the suspect is Omar Abu Laila, 18, from the town of az-Zawiya, and Israeli forces who raided the town overnight arrested his father and brother. The reports are attributed to Palestinian media, though most Palestinian media reports attribute the information to the Israeli army. The Shin Bet later confirms his identity. The resounding answer from the pundit class? It certainly looks like we are heading that way. Israel Hayom’s Nadav Shragai writes that terrorists don’t need an excuse to carry out attacks, but various factors have made it so inciters are “‘enjoying’ a period where it is especially ‘comfortable’ for them” from tensions over the Temple Mount, to financial crises in the West Bank and Gaza. 3. Operational failures: In Yedioth Ahronoth, Yossi Yehoshua says the ability of the attacker to kill a soldier, steal his gun and get away, while other troops were nearby, points to serious failures. “This seems to be an operational failure that is unthinkable after the events of the last months,” he writes, referring to other recent cases in which IDF terrorists managed to get away and avoid detection for weeks or more. 4. Defending democracy: Not surprisingly, where papers stand on the disqualification of Michael Ben Ari of Otzma Yehudit depends mostly on their politics, though everyone tries to dress up their positions as a defense of democracy. “The Supreme Court decided Sunday that to prevent a slide from insane talk to insane acts, it first had to deny the legitimacy of the hateful words in a clear and unequivocal way,” Odeh Bisharat writes in Haaretz, predicting that letting Ben Ari run could lead to a New Zealand-style massacre. Ben-Dror Yemini criticizes the decision in Yedioth, but only because the judges didn’t also disqualify the Ballad party and Hadash candidate Ofer Kassif, which he calls a “loss for democracy” that will only “increase extremism” in the Knesset. In Haaretz, respected jurist Mordechai Kremnitzer writes a stirring defense of the court’s decision to allow every other candidate to run, but says Ben Ari is different. Shlomo Pyoterofsky writes in Yedioth’s op-ed page that the court has “lost the public’s trust” by deciding to apply the law selectively. “Trust in the professionalism and objectivity of the judges has been cracked, if not totally disappeared,” he writes. 6. Good for the right? Otzma Yehudit has fumed over the decision and demanded Jewish Home renegotiate their deal and move Itamar Ben Gvir, who is still allowed to run, into Ben Ari’s No. 5 slot, something that’s not allowed. The Srugim national-religious news site reports that it’s so bad that Baruch Marzel, another Kahanist from Otzma Yehudit, is threatening to vote against the joint right-wing list that he is on. But in Walla, Yakir Adamkar notes that getting Ben Ari disqualified will actually help the far-right ticket by giving it another enemy — the court — to rail against. “From here out, they will campaign on the slogan ‘the judges won’t decide for the people who they will vote for, the people will decide,” he predicts. Makor Rishon’s Shirit Avitan Cohen writes that problems with the party go even deeper, with some doubting Rafi Peretz’s leadership ability and “vociferous fights” over whether the party should campaign directly against New Right. 7. More than a tweet: Ilhan Omar doesn’t have to worry about getting kicked out of Congress for her words, but she still appears to be making an effort to get back into the Democratic party’s good graces. An op-ed by Omar in the Washington Post, which she says is needed to explain her foreign policy outlook, doesn’t address the accusations against her of using anti-Semitic tropes. Rather it slickly expounds on her support for a two-state solution, and various other mainline talking points. “My goal in speaking out at all times has been to encourage both sides to move toward a peaceful two-state solution. We need to reinsert this call back into the public debate with urgency. Both parties must come to the table for a final peace deal; violence will not bring us any closer to that day,” she writes innocently. Mark Dubowitz of the hawkish Foundation for Defense of Democracy is one person not buying it, writing on Twitter that it seems like it came from a crisis communications firm. When I was throwing out those anti-Semitic bombs, all I really wanted was a more “inclusive foreign policy.” This reads like an oped written by a crisis communications firm for one of their so misunderstood clients.